One of the good things about the weekend is that you have more time to make a good breakfast. It had been a while since I last had pancakes and I was craving them. I had some over overripe bananas in the freezer and I though they would go nicely in the pancakes. I also had some buttermilk in the fridge so it became banana buttermilk pancakes with maple syrup. They turned out pretty good. They were nice and moist and fluffy. I enjoyed the banana flavour of the pancakes. I garnished the pancakes with slices of bananas and some pecans. They were a great way to start off a day on the weekend. Mix the flour, baking powder, sugar and salt in a large bowl. Mix the buttermilk, egg, butter and bananas in another bowl. hi Kevin, thanks for visitin my blog. my family loves pancake for breakfast too! those look wonderful! My husband has been trying to make pancakes and waffles on the weekends… I’ll be pointing this recipe out to him for next weekend! Yum! Nothing better than having extra time to enjoy a nice breakfast like that. Those look so nice and fluffy. Yum. Banana pancakes! It doesn’t get any better on a lazy Saturday morning! They look great! Those look wonderfully fluffy! And maple syrup is always a good thing. Good way of finding a bright side to all of this snow. Forget morning, I want them right now! Now, that’s a mouthful! Yum! my overripe bananas never look that good – i always have to mash them up into breads and what not! Hmmm. Interesting. I’ve never put mashed bananas in our banana pancakes. I always throw the slices onto the batter after I’ve ladled it onto the griddle. I’ll have to check out this method! If there was ever a time I make (I mean, cook) breakfast. I do eat pancakes for breakfast but it’s at Dennys. Now you know why I yearn for your pancakes. They are so much better in many ways! I know! What an amazingly delicious looking photo! I’ll have that for breakfast tomorrow please. I am definitely having banana pancakes tomorrow morning. Thanks for the inspiration! Wow…the pancakes look delicious!!! We just had them today from McDonalds 🙂 But these look way tastier. Pass them over in my direction, please. NOW! What a great idea to put the banana in the batter. Looks delicious! I was craving pancakes last week, but the ones I made weren’t that great. I want some of these! The husband do like pancakes, especially raspberry ones. I’m going to bookmarks this recipe for the weekend. only three pancakes for a serving? what are you thinking, man!? i have a feeling that a meal involving these pancakes would lead to a)changing into sweatpants, b)taking a nap, or c)all of the above. masterful! I bet those fluffy, delicious looking banana pancakes taste like a banana bread. Looks amazing! Oh that is funny. I made some buttermilk pancakes today. 🙂 Looks yummy. You have totally inspired me to make pancakes! I love eating them but never thought of making my own! 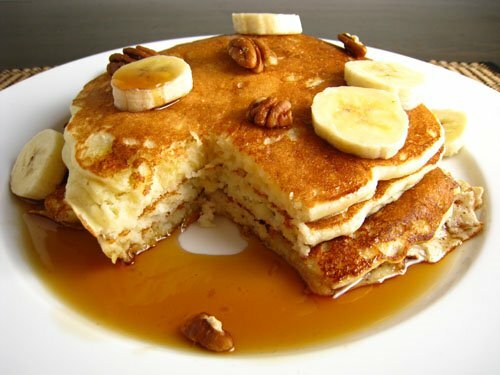 I’ve always sliced bananas into pancakes, never thought of doing the mash and adding them to the mix – what a great idea. You just opened a new door for me – thanks for that – and they look delicious and all that maple syrup goodness -drool. These look amazing Kevin. I can just imagine these with my Dad’s homemade maple syrup. I too enjoy making a fancier breakfast on the weekend. Thanks for the comment on my blog. I love this photo. The missing triangle absolutely makes it! The recipe sounds delicious, too. Look sooo delicious. Really great photo. I’ve been seeing some incredible pancake recipes lately. These look delicious! oh that looks all sorts of yummy. i’ve been on a major pancake crave, and i think that will do the trick this weekend! My mouth dropped open when the picture appeared…OMG that looks, so wonderful and comforting and just ridiculously yummy…Beautiful photo..
Time & time again, pancakes win people over for brekkie…just look at all the comments! oh boy, what a wonderful treat. Wow, these look so fluffy delicious! Well, I must say that these pancakes look anything but boring. I really want to eat them now. You are swiftly becoming one of my fave peeps: every time I’m looking for a fab recipe, Google sends me right to you. Love it. These were great for breakfast. Those look fantastic. I had complained about the March ’09 pancakes being burnt, but these are perfect. love love loved these pancakes, as did my hubs and four year old!!! thanks for all the great recipes!!! These did not work for me. Pancakes with fruit puree never turn out fluffy. Instead they are always soggy in the middle and never fluffy like the picture. This was delicious for me! I used one banana instead of two and it was perfect. YUM. Mine turned out a little flat and wet, so I added 1/4 cup more flour and 1/4 teaspoon of baking soda (because of the buttermilk) and it really fluffed them up 100 percent.